For more than 12 years, Heifer has been committed to development work in this island nation that has seen more than its share of natural disasters. 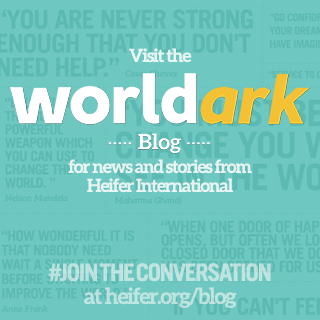 Learn about Heifer's current Haiti REACH project here. In the wake of Tropical Storm Isaac, Heifer International’s Haiti country team is reporting damage to several Heifer Haiti projects, including loss of animals, loss of and damage to gardens and homes, as well as damage to one breeding center. •In the community of Gressier, where Heifer works with MOPLANDAH, 32 goats were killed (eight from the breeding center and 24 that belonged to project families). The roof of the breeding center was also damaged. •In Petit Goave, where Heifer works with AIFO, one bull was killed and 86 small farms were destroyed. Irrigation canals were littered by debris. •In Montrouis, where Heifer works with Tet Kole, the water irrigation system for the forage crops around the breeding center was damaged, and one goat from the breeding center was killed. •In Ivwa, leaders reported that 50 houses were destroyed, and 10 homes built by Heifer had their roofs damaged or destroyed. •In the region of Artibonite (Lester and Marchand Dessalines), where Heifer is working with RACPABA, crops were lost. •On Lake Peligre in the center of the country, where Heifer is working with ACDELP on a cage-fishing project, fingerlings were killed by excessive sedimentation in the lake. •Information is pending from Gros Morne. Tropical Storm Isaac swept over the island Saturday (August 25, 2012), dumping torrential rains on the country and destroying several tent cities where survivors and refugees from the January 2010 earthquake were living. Heifer country staff continues to assess the situation and communicate with project leaders and participants, so more information will be shared as it becomes available. Heifer’s mission is to end hunger and poverty while caring for the Earth. Since 1944, Heifer International has provided livestock and environmentally sound agricultural training to improve the lives of those who struggle daily for reliable sources of food and income. Heifer is currently working in 40 countries, including the United States, to help families and communities become more self-reliant. For more information, visit www.heifer.org or call (800) 696-1918. 0 Response to "Heifer's Haiti Country Staff Reports Loss of Animals, Gardens"